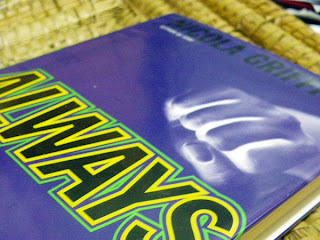 Always is the third in this series by Nicola Griffith, and like all her books, both award-winning and brilliant. There are constant references to her loss in The Blue Place, and most of the story revolves around her emotional healing. So it is slightly spoilerish, and it helps to have read the previous book. There's an odd dual timeline (flashbacks every other chapter) between the past - much like in Slow River [read the review of Slow River here], only in a different pattern. It follows the story of Aud Torvegsen, a Norwegian ex-Police Detective. Aud is casually, happily lesbian, and notices women - something that can be taken for granted, but really makes a book real. In the past, Aud is running a self defence class for women, leading up to some drama, which is really interesting and includes a lot of real information (the best way to... injure, think, act, characterisation, attitudes and how people can manipulate you... as well as ways to pop someone's eyeball, the old 'everything is a weapon' drill). Naturally, one woman has a very real and immediate reason to learn self-defence... although it doesn't end the way one would expect. The current timeline is a sort-of a detective story, showing that Aud is both very intelligent, paranoid, and tough. She's still getting over the events of the self defence class (which are slowly revealed as we read through the book) and is completely thrown by her rather distant mother re-marrying.Her father left her a fortune, and property, and she spends most of the time investigating what's going on with one property. It's currently being rented out by a film crew, and Aud gets involved in trying to help solve their problems. And then of course, she falls in love. But while everything else get solved, one way or another, her new love affair is fatally flawed. It seems Aud never gets to be happy... but that's where we leave them, determined to make the best of it. At the end of the book she recommends The Gift of Fear and Other Survival Signals that Protect Us From Violence (most current at the time of the book, for the 1990s). Read an overview of all three books in this series. Read all reviews of Nicola Griffith's books.